By Kirsten Indebted 2 Comments - The content of this website often contains affiliate links and I may be compensated if you buy through those links (at no cost to you!). Learn more about how we make money. Last edited December 1, 2014 . I‘m at a crossroads in my life – I'm a full-time working mom of two small children. I would love to stay home with them, but as the top earner and with our family's significant student loan debt, I have questions about whether leaving the workforce is the path that God wants for my life. Perhaps you are in a similar circumstance or maybe you are wondering if you should leave your job for an uncertain opportunity like working for yourself or for a start-up. These decisions might mean taking a big leap of faith. Is there anything wrong with taking a big leap of faith? Maybe not. After all, Jesus said that faith the size of a mustard seed (the tiniest seed of all) could move mountains (Matt 17:20). Jesus also tells us that God takes care of our basic needs and that we shouldn't worry (Matt 6:25-34). Why, then, does the Bible provide such strong words about providing for our families? 1st Timothy 5:8 says that people who do not provide for their families “have denied the faith”. 2nd Thessalonians 3:10 says that men who do not work, should not eat. Making a living certainly seems to be a very important Biblical matter! 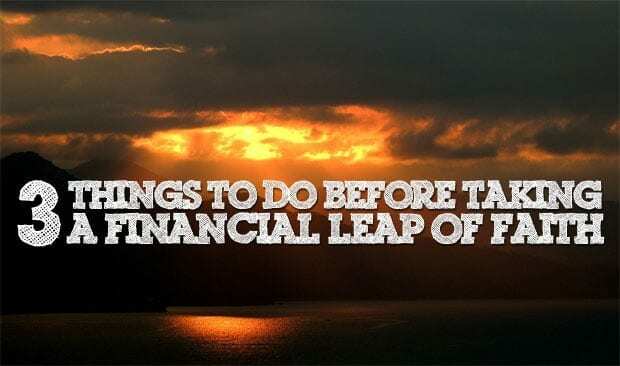 Before we go further, let me point out that taking a big leap of faith – with uncertain income – isn't exactly sitting idly by and watching your family starve. The context of 1st Timothy 5:8 was directed at people who expected others to care for their relatives and 2nd Thessalonians 3:10 was aimed at folks who would rather gossip than work. So if you are worried about switching jobs, you can see that these warnings aren't aimed at your decision. And if you are looking to be a stay-at-home mom, you probably realize that it's hard work and hardly qualifies as being lazy. It's an honorable, if unpaid, profession that cares for your family. Lean not on your own understanding (Prov 3:5) – in other words, don't look just to your ways and what you want. Seek God. You can do this by asking God to provide wisdom for the decision making process (and feel free to ask Him more than once). Then, turn to scripture and make sure you understand His will. Your situation is unique to you, but the guidance provided is timeless. God is the ultimate counselor, but when you feel really confused about what move to make next, it doesn't hurt to seek out qualified professionals or even trusted friends and family. In fact, seeking wise counsel is a very Biblical concept (Prov 11:4)! In this case, you might want to run through your financial situation with a certified financial planner or a tax professional. Do you have friends or siblings who recently left their jobs for a less certain financial situation? See what lessons learned they have; they might put your fears to rest or possibly raise more warning flags. The final step is the most important – look before you leap. Impulsively running down just any old path in life is sure to involve one or two twisted ankles along the way. Study up on the matter. Maybe you thought it was an all-or-nothing decision, but perhaps going part-time is really the best answer for your situation. Or maybe you find that you really don't have the money to stay home, but you found a way to earn money on the side. Look into all possibilities (Proverbs 18:13), prayerfully weighing them out. There's no time frame on this action plan – you might have your answer in a day or maybe a year. Stick with it, trusting God, and you'll arrive at the destination He has picked out for you. When you look back, you'll see the journey was the right one, at the right time. Have you ever made a decision and then realized you didn't do what God really wanted? How did you correct your course? If you stay home or have made a scary career transition, did you step out in faith or did you know for sure that God was calling you to make the change? Last Edited: 1st December 2014 The content of biblemoneymatters.com is for general information purposes only and does not constitute professional advice. Visitors to biblemoneymatters.com should not act upon the content or information without first seeking appropriate professional advice. In accordance with the latest FTC guidelines, we declare that we have a financial relationship with every company mentioned on this site. Kirsten is a full-time working mom of two small girls, who would like to trade her job as a real-life rocket scientist for a rewarding career as a stay-at-home mom. Kirsten blogs about their significant student loan debt and the intersection of faith and finances at indebtedmom.com. You can also find her on Twitter and Facebook! I work at home and I’m sure that God lead me into it. He never fails. When our daughter was born I tried to work outside the home and was absolutely miserable. My husband and I had agreed before we were married that we wanted one parent home to raise our children, if we were blessed to have them. Fortunately, we were pretty financially illiterate when I quit my job to stay home with her, otherwise we might not have made the move. We made due and have figured it out. I’ve sold Tupperware (profitably), worked part-time, had an eBay business, and done numerous other things to bring in the extra cash we’ve wanted or needed. We’ve also cut expenses and reshaped our lifestyle tremendously to reflect what really matters to us. She’s now 9 and we homeschool and have no regrets. We wouldn’t have had it any other way. Next Post: Tablo TV Over-The-Air DVR: The Cord Cutters Dream!